Travelling with a little one can be a great and worse experience, depending totally on how comfortable the little one feels. 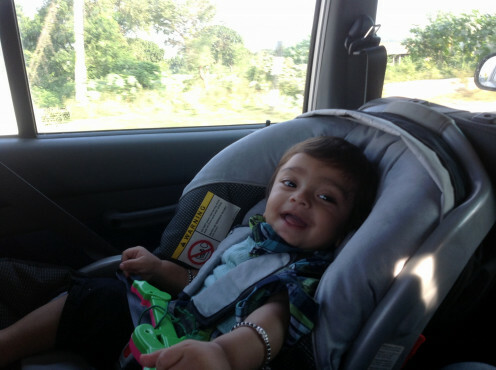 If baby is happy our trip sounds amazing but a slight disturbance to baby can make trip worse. Babies enjoy travelling to new place as it adds to their nature of discovering new place and surroundings, so being a parent we need to make sure that the baby is comfortable by carrying appropriate baby stuff to make baby comfortable. This list I made is out of my experience and some googling ofcourse. I have tried to cover all major and minor things baby needs to feel comfortable but I am sure you too would have your experiences to share on how can we make the trip amazing, so please use the comment box to share your views. Depending on the temperature of place of visit decide on winter or summer clothing. It might sound strange but its always better to carry 2/3 more dresses than the number of days and times of change in a day. This should apply on all items like socks, sweaters, shoes, vest, pants etc. Attimes baby might get uncomfortable due to food or altitude or any other thing leading him to vomit or they might drop something on their dress, at these times an extra dress in changing bag really helps. Incase you are traveling to a colder location make sure you are aware of the temperatures and accordingly carry sweaters, jackets, warmers. A little extra does lesser harm but gives more joy. Though babies love other babies toys more than their but they still have a strong association with their own toys. Always carry 5-6 toys baby really loves. This will give them a feel of home and help them relax and play better. And ofcourse you can buy some new toys to add to excitement. Always carry good quantity and variety of baby food. Babies tend to get bored from one taste, hence variety will help. Also, in case you are staying in a good hotel, you can also request the chef to cook a simple meal for your baby as per your instructions. This way baby would not be dependent on readymade food and you can offer him new taste. Carry your set of saucers, bowls with lid, spoons, bottles, thermoflasks for the baby. Make sure you carry the baby products you use for your baby, include all the items you make your baby use like soap, shampoo, powder, cream, oil, paste, brush and towel. Holiday is not the right time to experiment with new brands or products. Make sure you carry basic medicines on suggestion of your doctor for mild problems like fever, cold, cough, vomiting etc. And make sure you have a list with what to use when and how much at what frequency. Baby stroller are a must carry on holidays. Its not easy to carry baby in arms everytime. Since you’ll be roaming around the new place exploring the new city, its best to be comfortable yourself and make the baby comfortable too. Carry adequate stroller bedding, like a small pillow, blanket in the stroller, plastic shield for rainy and windy areas. In case you are traveling to a less inhibited place carry a good supply of diapers along with you. In case you are traveling to a major city, it’s better you carry 2-3 days supply post which you can purchase from there. If you baby sleeps with a specific toy or a blanket make sure you carry that. Hotels mostly have various size pillows, its better to carry your own baby pillow and bay blanket. For beaches do carry beach play set, swimming costume. For cold places make sure you carry good baby jackets and baby blankets, caps, socks. For hotter destinations, carry a pair of glasses or cap to cover his head and eyes.